So here we are, its the weekend, and I have a couple of presents to unbox and use. First one is the 2010 White Dwarf subscription model, yes they used to give away models, that my partner managed to pick up for me for a princely sum of £37. 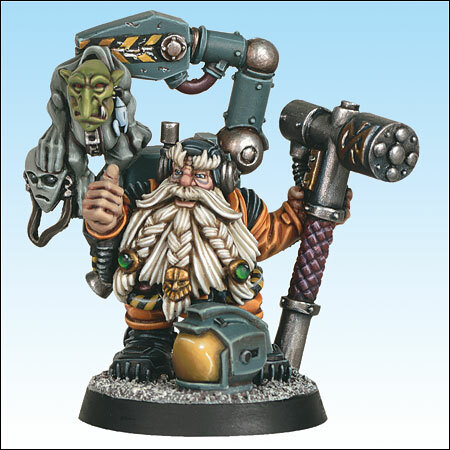 Now this maybe the first time you have seen Grombrindal, to give him his proper name, as a Squat, which in itself is a rarity as Squats were discontinued as a Warhammer 40k race back in 4th or 5th edition. 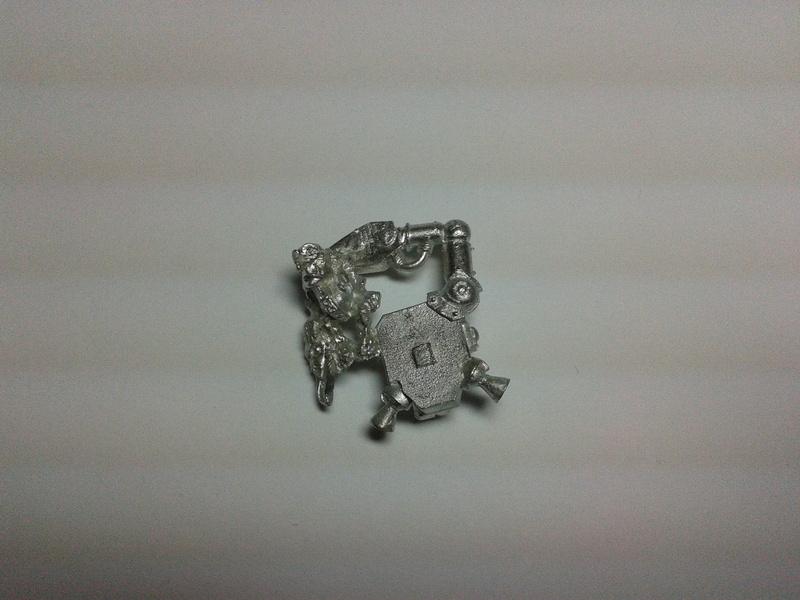 It’s also one of the miniatures that I am going to paint, and base, for the 1st ‘Eavier Metal painting competition. If you aren’t a member of this group on facebook and you want to see some stunningly painted miniatures, or even show your own work, then come join us. 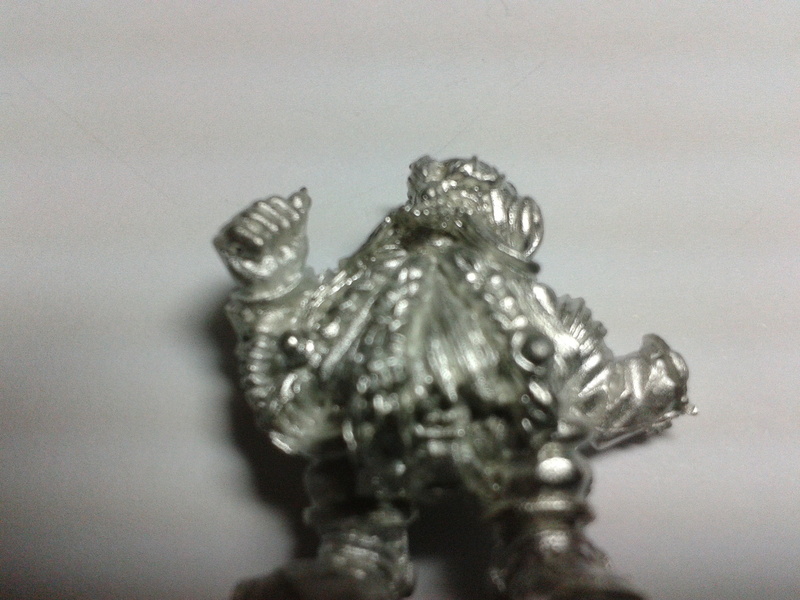 Grombrindal – The White Dwarf Squat. 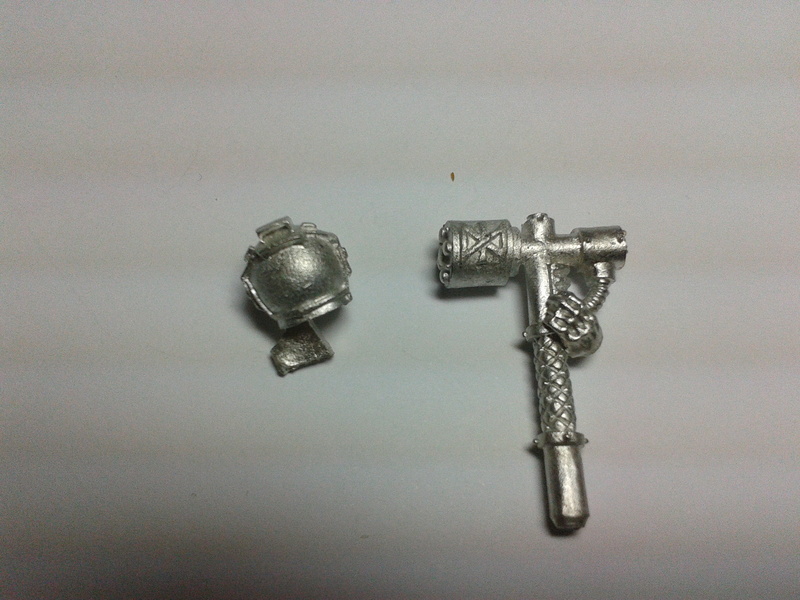 The miniature, unlike most of the GW range, actually comes in white metal rather than plastic or resin. This means, even though making it slightly more difficult to paint, it has a lot of details on him. The one I am about to show you is a painted version I found on Google, I unfortunately don’t know the artist that painted him, but it is a stunning paint job and one I’m hoping to either emulate or beat, and will give you a rough idea of what he should look like. So being a miniature that was brought from auction, he doesn’t come in the blister pack, or box, that he was supplied in when brand new. However that doesn’t stop me from describing and photographing him to show you how good this sculpt actually is. 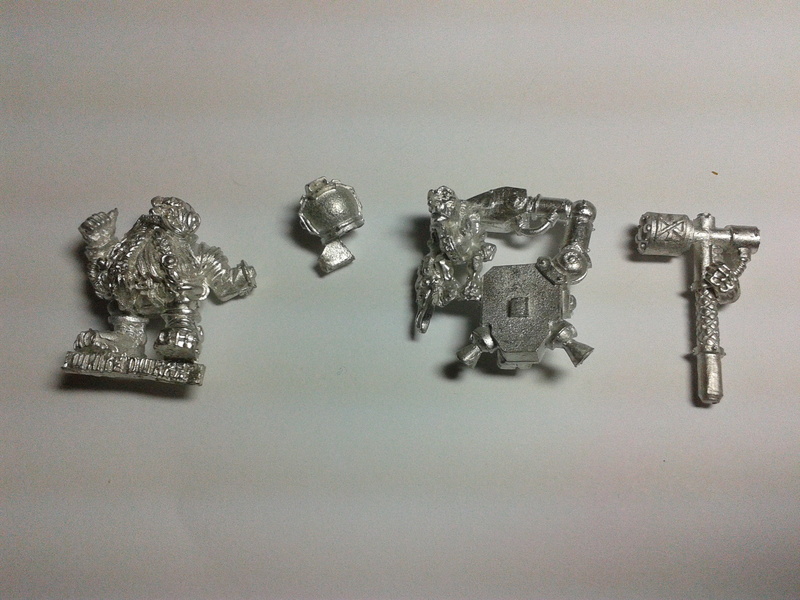 The miniature itself comes in 4 sections, the main body, the helmet, the backback (with attached gretchin) and his hammer arm. Now to say this model is nice is an understatement, its one of the best sculpts I’ve seen come out of GW, and well worth painting up to show off his full glory and potential and one I am honored to have in my collection. The beard alone is of particularly fine detail, and each hair is individually sculpted if only a little thick, so over all it could do with a few more tiny details to make it look more natural. However, this is not a sculpt that is like an “Out of Production” Rackham or other brands out there, so you cant expect too much. His face however, is great, and full of lines and wrinkles that you would expect for a character of his age and distinction, right down to the bags under his eyes, so he is full of expression and has a definite “Caught It” look. 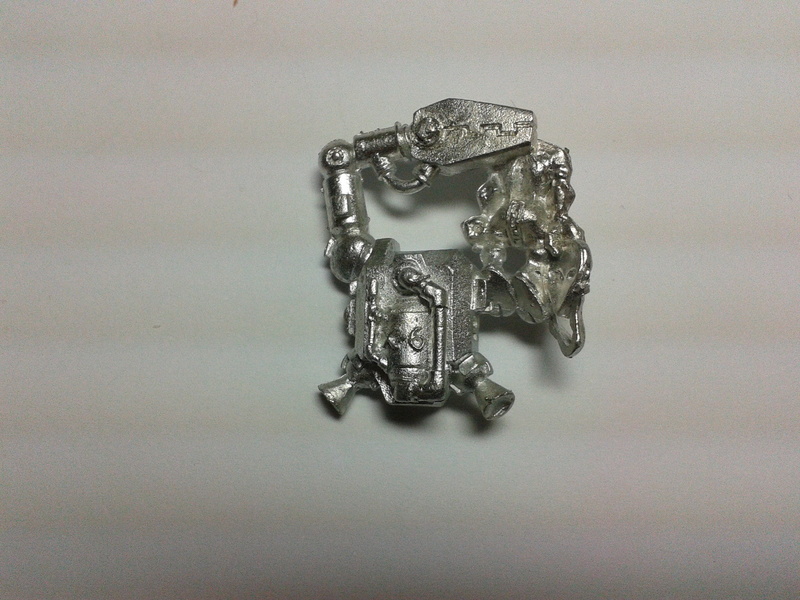 The backpack, now that is very well cast, from the X-6 on the tank to the gretchin caught in the mechanical arm. 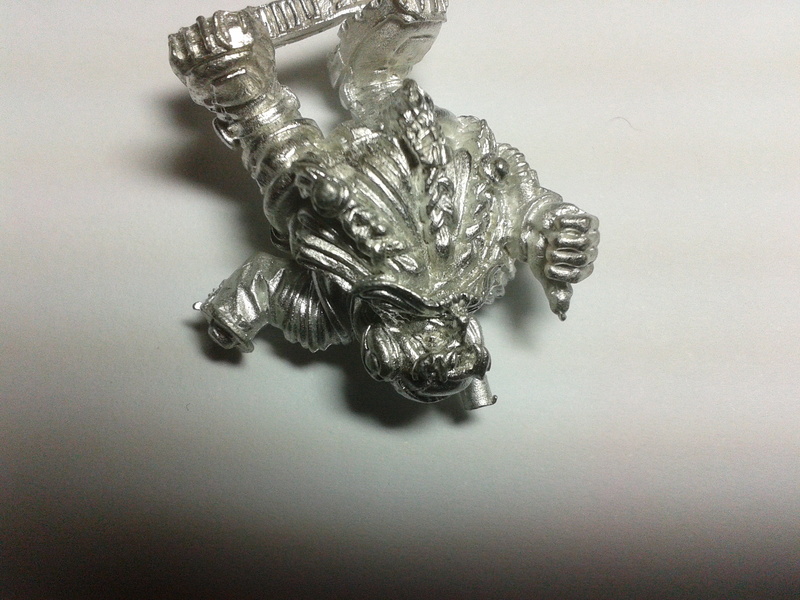 I cant actually see any mould lines on the entire miniature, which is very rare. 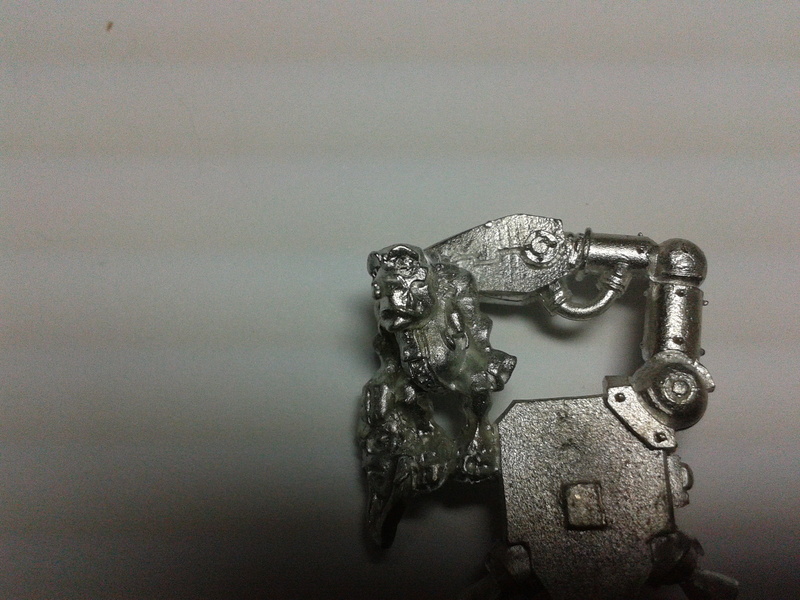 The gretchin, Space Goblin, just has a resigned face on it as his disguise has been rumbled (see the painted pic) and he forlornly holds his “Roswell Alien” style mask in his hand. I think its just a comic moment, in miniature form, and well worth a small chuckle to yourself. The Helmet, unlike the squats of old, is actually what looks like a standard Astronauts helmet, with a few adaptations on the back of it. This will go well with Grombrindals suit which doesnt look like either an Imperial Guards outfit or Power Armour, but like a standard suit that we would see Astronauts wearing today. The Hammer and the hand is also very well moulded and has no lines visible to the naked eye, the head itself has a Dwarven rune cast upon each side, and the handle has each individual marking on the grip defined. So I hope you have liked what you have seen and read, and hopefully, either later today, or Monday, I will be writing up an unboxing blog on some Rosemary & Co Series 8, 22 & 33 brushes and later in the week a complete review of them… so keep watching this blog for updates.